The Ozark Mountains have a long stretch of territory in both Arkansas and Missouri. One of the popular wilderness destinations in the Midwest, the Ozarks is a great place for forages to collect wild edible foodstuffs to bring to the camp or home for dinner. With some knowledge about edible plants, this can help backcountry trekkers who want to avoid hunger in the event of getting lost in the wilderness. In the Ozarks, anyone can easily find classic wild edible food such as elderberries, and the ever-popular blackberries and black raspberries. There are also wild vegetables that can easily be found in the Ozarks such as onions and milkweed. Milkweed requires some boiling before its seedpod and leaves can be eaten. They are poisonous if eaten raw. The oxalis or wood sorrel can also be found in the Ozarks. This plant is basically potatoes and great for wild food source. Its leaves can also be used as tea. There are also several trees in the Ozarks that are a great source of nuts. The red and white oaks both provide acorns, while walnuts and black walnuts are good food source as well. The plantain leaves in the Ozarks, especially when young is a good addition to a wild salad. Plantain doesn’t need much cooking nor much water. The best method is to boil it quickly in very little water until tender. A tea may be made from leaves that are boiled for 3 to 4 minutes. The tea made from plantain leaves is soothing and considered helpful for diarrhea, bedwetting and ridding the body of worms. It can also be applied externally to aid healing of insect bites and snake bites. The seeds of the plantain may be eaten parched or ground into a meal. It can also be soaked in a teaspoon of hot water and used as a laxative. The young leaves are very good for salad. The Bedstraw that grows in valleys or moist woodland can be used as potherb, salad, or coffee substitute. Bedstraw was once used in the past by stout women in their diet to have a thin figure. It was once used also as a tonic to purify the blood. If it gathered young it can also be added to a tossed salad and can also be made as coffee. Coffee made from bedstraw seed is said to have an aroma much like that of regular coffee. Black Haw Berries are large shrubs or small trees which leaves are oval shaped. Flowers of this tree form large clusters on ends of branches. Habitat of this tree is in rocky stream banks, base and edge of bluffs, rocky or dry woods. This can be found mostly in the Ozark region of southern and central Missouri. When ripe, this berry becomes bluish or blackish coloring. 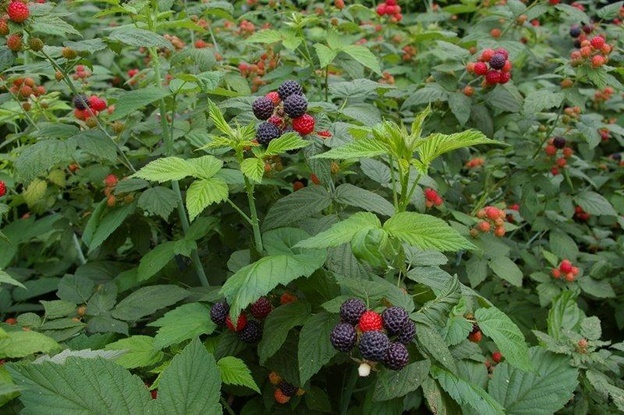 If you get lost while hiking in the Ozark mountains, you will never be hungry in the wilderness because you can find plenty of wild edible foods such as blackberries and black raspberries.